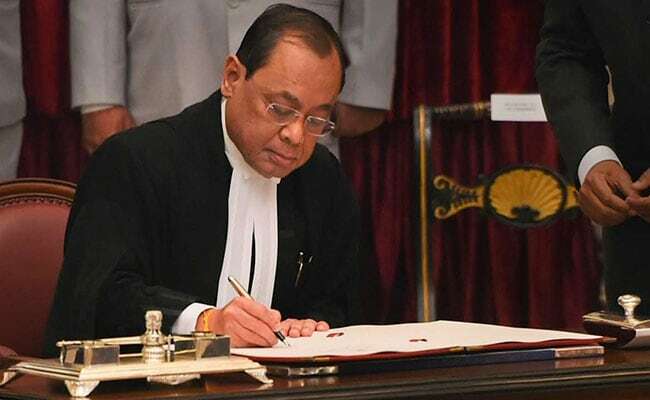 Justice Ranjan Gogoi was Wednesday sworn in as the 46th Chief Justice of India (CJI). He succeeds Justice Dipak Misra. Chief Justice Ranjan Gogoi succeeds Justice Dipak Misra. Retired Supreme Court judge N Santosh Hegde Wednesday advised the newly appointed Chief Justice of India, Justice Ranjan Gogoi to bring in more transparency in judicial proceedings and promote solidarity between judges to avoid any "misunderstanding". "Also, he (Justice Gogoi) should give an impression to the public that judges are one when it comes to justice," the former Solicitor General of India told PTI. Justice Gogoi was among the four senior-most judges who had in January criticised the then Chief Justice Dipak Misra, especially the manner of allocation of cases to certain benches. Santosh Hegde said Justice Gogoi's primary responsibility would now be to reduce the huge pendency of cases in courts, and he was glad the new Chief Justice of India had already spoken on the issue. Justice Gogoi said last week that he had a plan to deal with pendency of cases which has been bringing in a lot of "disrepute" to the judicial system. He said he had a plan to deal with the backlog of cases and he would "unfold" it soon. Hegde, also former Lokayukta of Karnataka, said, "He (Justice Gogoi) should bring more transparency in the judicial proceedings. They (Supreme Court) have already decided on videographing (live-streaming) of proceedings. That apart, misunderstanding that the judges had in the last regime, should not be repeated". "That misunderstanding has led to a lot of scenes....problem with people whose respect (towards Judiciary) is reducing. Once people lose respect of the judicial institution, that is end of democracy," he said. Hegde said the CJI should take fellow judges into confidence and discuss their views so that they will also develop a confidence in him. "Probably that lack (of such a practice) has led to some misunderstanding (during the previous regime) which has become a public issue and many things happened thereafter which should not happen," Hegde said. "He (Justice Gogoi) should bring about transparency in judicial administration and solidarity between the judges. Administrative solidarity should be there," he noted. "(Judicial) vacancies should be filled in a timely manner because any delay adds on to the backlog. It is like Hanuman's tail, it goes longer and longer and longer. If he is able to reduce the pendency of cases, that itself would be a great achievement," Mr Hegde added.